Cas Costas Grill & Organic Market makes food made from its own organic vegetable garden. When you read 'garden vegetables' on the menu at Cas Costas Grill & Organic Market, it is for real: the vegetables are from the restaurant's own organic garden. The staff quite literally walk outside and pick up the ingredients from the newly planted vegetable patch. We went to find out more and see how our meals went from garden to plate. If you have never tried freshly picked homegrown organic garden vegetables, you are missing out. It is a whole other world and nothing at the supermarket can even come close. At Cas Costas, vegetables are an integral part of the menu. Fernando the chef himself showed us his entire process, from picking the vegetables in front of us to watching him prepare them in two seasonal dishes. To get the best showcase, we went for the grilled garden zucchini (courgettes) and mushroom salad peppered with basil leaves, toasted hazelnuts and parmesan reggiano. We also had stracciatella cheese with more grilled courgettes, grilled aubergines, cherry tomatoes, toasted pine nuts and a balsamic honey dressing. The result was an incredible intensity of flavour letting the freshness of the vegetables sing out using a fine and flavourful ingredients' combination. Nico, the gardener and a master of the art created this 100% organic garden right next to the restaurant. It was created literally from the earth (it did not exist before) and carries on the tradition of growing your own food on the island. Using elements of permaculture and bio-culture, he grows everything without using any chemicals. Even the spot where the garden appears came from careful consideration. Nico selected the land based on a rigorous soil analysis revealing where the soil was richest. The garden ended up coming to life around a young olive tree and a carob tree with palm trees along the side - having trees nearby is an important factor, apparently. Many aromatic herbs line the garden with quite a big section for herbs also across from the main vegetable growing bit. These herbs are planted next to certain fruits and vegetables, which gives them natural protection from pests. Quite a lot of herbs are planted: basil, rosemary, lavender, black mint, two types of parsley, coriander, chives, thyme and event curry leaf. You will also find flowers including the wonderfully soothing camomile. Thankfully the aromas of these plants remain appealing to humans. The combinations are far from random. Specific aromatic herbs keep away the exact pests that are attracted to the vegetable that Nico plants them around. The cucumbers, for example, grow surrounded by basil, thyme, parsley, calendulas and pansies (both also edible flowers) that protect them naturally. This means no need for chemicals on your cucumbers. What's in season is what you get on your plate. If you go now, you will see all kinds of vegetables from five different kinds of tomatoes, strawberries, courgettes, leeks, onions, asparagus, fennel, chard, and much more. It is quite a larder. Bees are also an essential part of the system both for pollination and protection against other insects. To keep them there, bee larvae are placed in bee houses in a moist environment so that they continue to live there once they hatch. The presence of bees is necessary to the functioning of the ecosystem as they also keep certain pests away, allowing the flourishing of the garden. In nature, one thing has to eat the other. If you are missing one, the other grows too much and the system does not work. The bees protect their territory, keeping away the pests while the herbs create a barrier on the other side. Rather than killing organisms, the organic garden gets the plants to live together happily. Bio-organic agriculture exclusively uses natural repellents provided by nature. The rest is done by maintaining ideal growing conditions for the plants. The soil is fed from a compost made with organic leftovers from the kitchen. Even the temperature of the soil is monitored to promote growth. Surrounded by nature, we picked the courgettes, three different types of basil, pansies and curly parsley. The tomatoes were not quite ready yet but are growing well. Already by the time of writing this article, the garden will already be overflowing with even more ingredients for the restaurant. Back inside the restaurant, Fernando the chef prepares the dishes before our very eyes. While a salad made primarily of basil leaves might seem to be too intense, the combination of ingredients, including the courgettes, mushrooms and toasted hazelnuts, allows the flavours to mingle. The vegetables are often enlivened with the deep flavours of top quality cheeses, on this occasion from Italy: high quality parmesan reggiano and stracciatella add depth and flavour. Stracciatella is made from the heart of a fine buffalo mozzarella from the south of Italy, mashed to a creamy consistency. Atop this decadent delicacy, the grilled courgettes, eggplant and cherry tomatoes were sprinkled with toasted pine nuts, pansies, curly parsley and balsamic honey dressing. This combination created an explosion of flavour. The secret to the exceptional taste of these seemingly simple dishes is manifold. The growth methods and freshness of the vegetables are the foundation of the enhanced flavours. These are then complemented by the combination of top quality ingredients and superior preparation methods. For the stracciatella cheese with grilled veggies, for example, the very thinly sliced aubergine are not fried but baked in the Josper oven. This top of the line charcoal oven is the Rolls Royce of ovens and is used by the best kitchens. Any organic leftovers from the preparation or the dishes make their way back into the vegetable patch as fertiliser, creating an ongoing cycle between the two. The soil of the garden is fed by the restaurant in a never ending cycle adding to the magic of the dishes. This summer, as more vegetables come into season, increasing dishes will be made directly from the garden. The gazpacho with tomatoes, cucumbers and herbs, for one, will be made entirely from the garden. The menu, of course, will change throughout out the season as nature intended, so expect an ever-changing selection. 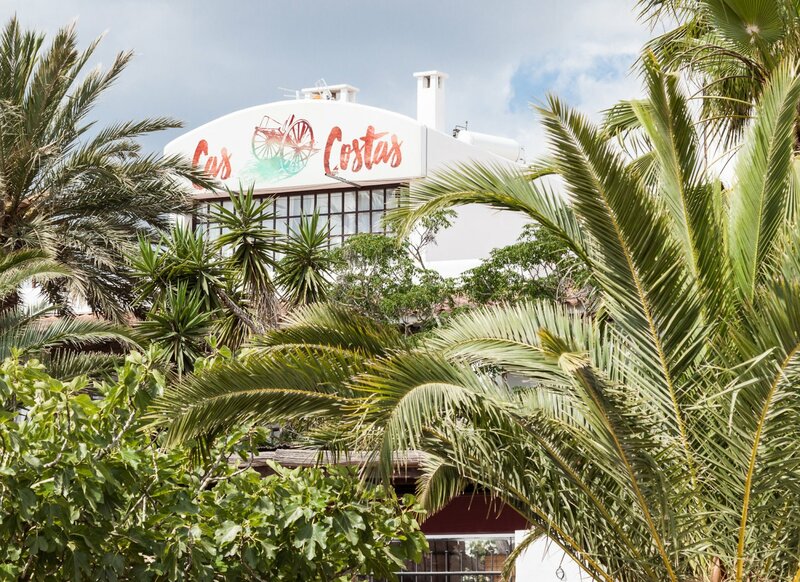 If intense flavour and natural organic ingredients are what you are after, you cannot miss out on Cas Costas this summer. Check it out and let us know what you thought. Our restaurant guide has the best selection of top places to eat in all across Ibiza. Time you went over there.